InDesign offers unique advantages for kick-starting a website design, such as its unmatched typographic control, pixel-perfect positioning, and fluid, intuitive layout environment. InDesign offers designers who want to quickly create webpage prototypes a powerful toolset with robust text and object styles, page grid features, and interactivity—and none of the limitations of Photoshop, complexities of Dreamweaver, or burdens of hand-coding HTML and CSS. 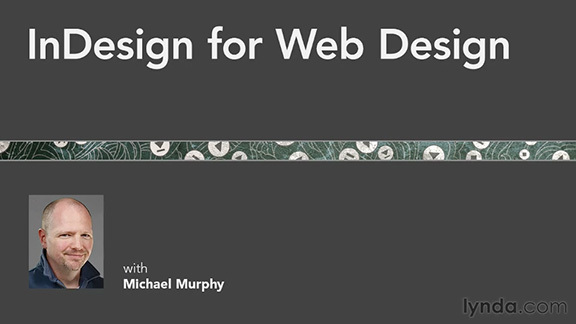 This course shows aspiring web designers how to set up documents for the web, utilize web fonts for maximum compatibility, design a navigation bar, and even mimic CSS with InDesign styles. The final chapter shows how to export your mockups as HTML, CSS, PDF, SWF, and web-optimized images that can be shown to clients or quickly published to the web.